Today, Kathy Absolon-King is a highly regarded associate professor and associate dean of the Aboriginal Field of Study in the Master of Social Work program at Wilfrid Laurier University. When she was a little girl, however, she didn’t like school. Absolon-King is Anishinaabe kwe, of Flying Post First Nation. Growing up off the reserve, “in the bush” of northern Ontario, she faced daily racism at school, she says. To gain some perspective and comfort, she used to ask her mother to tell her stories about her own school days. 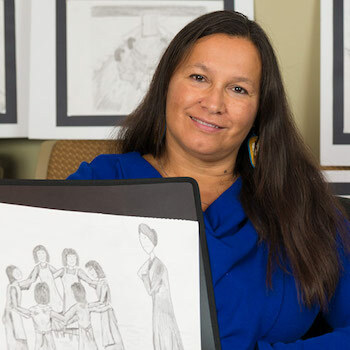 Today, as an adult educator and knowledge seeker, she has turned some of her mother’s residential school stories into films, one of which will be presented at the Aboriginal Student Centre on Laurier’s Waterloo campus on Mar. 8, during Laurier’s Aboriginal Education Week. Absolon-King’s mother, Jennie Absolon (Cryer), 85, survived 10 years at the St. John’s Anglican Indian Residential School in Chapleau, Ontario, where like other First Nations children, she was subjected to policies of cultural genocide expressed through abusive and demeaning treatment. As a mother, however, she did not share her traumatic stories with her daughter. Instead, she shared stories about how she and the other children coped. Stories about stealing carrots. About refusing to sew her number onto her skirt – children in the residential school were numbered. About crossing the school boundary so she could go smell fresh flowers. Stories, often, about defying and disobeying the nuns’ and matrons’ rules. A few years ago, while on a sabbatical, Absolon-King commenced an Indigenist “re-search” journey. Absolon-King is the author of Kaandosowin: How We Come to Know (2011). In her book she examines Indigenous ways of re-searching and describes how Indigenous re-searchers are re-theorizing and recreating methodologies grounded in Indigenous knowledge. One of the re-search methods she decided on during her sabbatical was gathering stories through film. She wanted to videotape her mother’s stories, initially because she wanted to record her mother speaking for herself, without someone else’s interpretation. Absolon-King did interpret her mother’s stories in one way, though – she turned them into art. The art became a means of working through their meaning and representing pivotal moments in the stories. Then she combined her mother’s stories and her own artwork to make her movies. She first presented one of her films at as part of her keynote address at a conference in Sarnia in April 2016 and again at an Indigenist research symposium at Laurier in December 2016. She is also soon presenting the films to City of Brantford employees for Indigenous awareness staff training, a project in partnership with Brantford Native Housing. In the future, Absolon-King plans to complete a second film and publish transcripts of both films along with some of her own analysis, and thus make her mother’s memories more widely available. Preserving memories is particularly important for Indigenous peoples because residential schools resulted in “a mass interruption of the transmission of knowledge,” she says. Jennie Absolon has also made efforts to speak out about the truth of life in the residential school. She testified about the traumatic impact of her experiences to the Truth and Reconciliation Commission, which operated between 2008 and 2015. She also attended the keynote address her daughter gave at the Association of Native Child and Family Services Agencies of Ontario conference in Sarnia. Absolon-King would like to see others ask the elders close to them for their stories. The screening of Absolon-King’s film, Resilience, Resistance, Strength and Hope, will be accompanied by discussion and will run from 1 p.m. to 3 p.m. on Wednesday, Mar. 8 at 187 Albert Street, Waterloo. It is one of a series of Aboriginal Education Week events.